Do you believe we’re nearing the end times? 1. Matthew 24: 3-13, King James Version (KJV): 3 And as he sat upon the mount of Olives, the disciples came unto him privately, saying, Tell us, when shall these things be? and what shall be the sign of thy coming, and of the end of the world? 4 And Jesus answered and said unto them, Take heed that no man deceive you. 5 For many shall come in my name, saying, I am Christ; and shall deceive many. 6 And ye shall hear of wars and rumours of wars: see that ye be not troubled: for all these things must come to pass, but the end is not yet. 7 For nation shall rise against nation, and kingdom against kingdom: and there shall be famines, and pestilences, and earthquakes, in divers places. 8 All these are the beginning of sorrows. 9 Then shall they deliver you up to be afflicted, and shall kill you: and ye shall be hated of all nations for my name’s sake. 10 And then shall many be offended, and shall betray one another, and shall hate one another. 11 And many false prophets shall rise, and shall deceive many. 12 And because iniquity shall abound, the love of many shall wax cold. 13 But he that shall endure unto the end, the same shall be saved. 2. 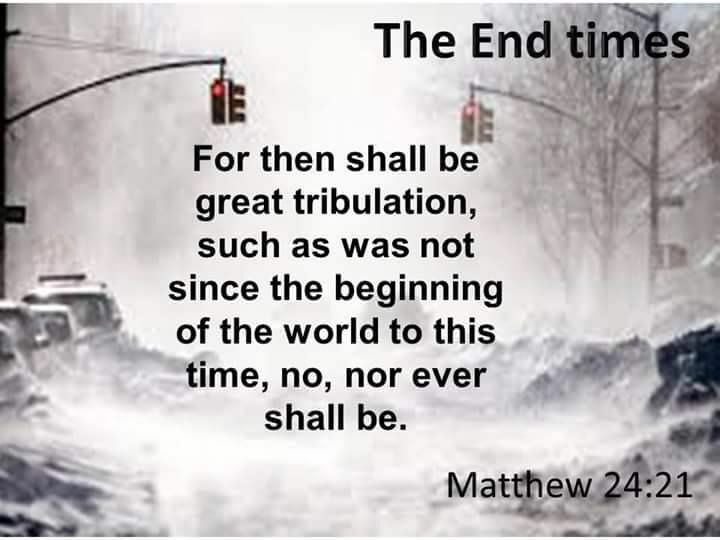 Matthew 24: 21-31, KJV: 21 For then shall be great tribulation, such as was not since the beginning of the world to this time, no, nor ever shall be. 22 And except those days should be shortened, there should no flesh be saved: but for the elect’s sake those days shall be shortened. 23 Then if any man shall say unto you, Lo, here is Christ, or there; believe it not. 24 For there shall arise false Christs, and false prophets, and shall shew great signs and wonders; insomuch that, if it were possible, they shall deceive the very elect. 25 Behold, I have told you before. 26 Wherefore if they shall say unto you, Behold, he is in the desert; go not forth: behold, he is in the secret chambers; believe it not. 27 For as the lightning cometh out of the east, and shineth even unto the west; so shall also the coming of the Son of man be. 28 For wheresoever the carcase is, there will the eagles be gathered together. 29 Immediately after the tribulation of those days shall the sun be darkened, and the moon shall not give her light, and the stars shall fall from heaven, and the powers of the heavens shall be shaken: 30 And then shall appear the sign of the Son of man in heaven: and then shall all the tribes of the earth mourn, and they shall see the Son of man coming in the clouds of heaven with power and great glory. 31 And he shall send his angels with a great sound of a trumpet, and they shall gather together his elect from the four winds, from one end of heaven to the other. There is far more that should be said, correctly examined, and spiritually apprehended. (For example, 3. 2nd Timothy 3: 1-5, KJV: 1 This know also, that in the last days perilous times shall come. 2 For men shall be lovers of their own selves, covetous, boasters, proud, blasphemers, disobedient to parents, unthankful, unholy, 3 Without natural affection, trucebreakers, false accusers, incontinent, fierce, despisers of those that are good, 4 Traitors, heady, highminded, lovers of pleasures more than lovers of God; 5 Having a form of godliness, but denying the power thereof: from such turn away.) Even so, I trust this fragment will be useful. Be it unto you according to your faith. AN AFTERTHOUGHT: There are multiple meanings in use where Christian believers speak of “the end.” When referring to “end times,” many intend the period leading up to the final completion or fulfillment of prophecies and visions that are recorded in the Bible. Destruction, punishment, the second death, and the termination of duration and existence for the devil, for sin, and for the man-made belief system intended to ensure human survival (we say, the world) also are the focus for many presentations. Christians are cautioned to remember that their salvation begun through repentance and rebirth is an eternal life that is a new creation. When the end of mortality appears, followers of Jesus Christ will be continued through judgment, resurrection, and transformation to exist as life companions to immortal, incorruptible divinity. Nor will there be an end to the immutable, unchanging word of GOD. 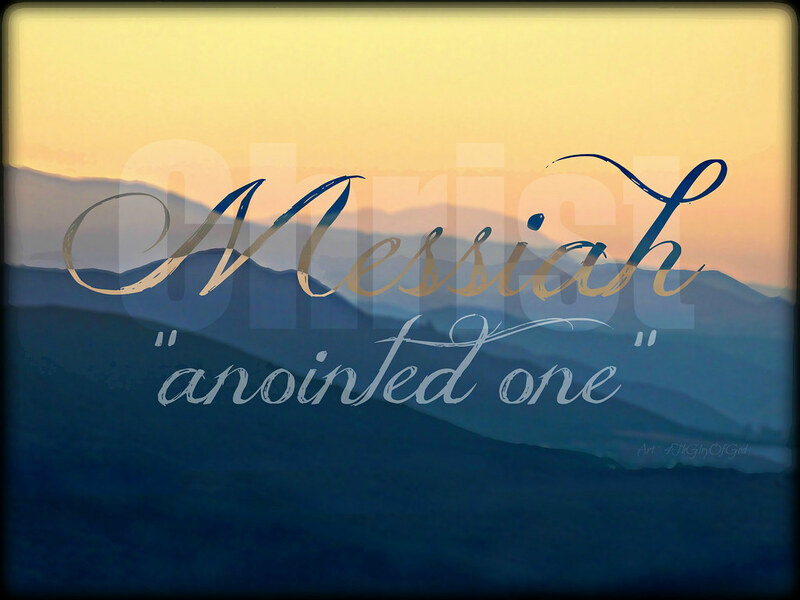 Old Testament prophecies concerning the coming of the Messiah were fulfilled by Christ to the smallest possible detail. What makes you think the remaining prophecies will not come to pass, even if all remaining prophecies occur after our death? 1. Joshua 4: 5-7, King James Version (KJV): 5 And Joshua said unto them, Pass over before the ark of the LORD your God into the midst of Jordan, and take you up every man of you a stone upon his shoulder, according unto the number of the tribes of the children of Israel: 6 That this may be a sign among you, that when your children ask their fathers in time to come, saying, What mean ye by these stones? 7 Then ye shall answer them, That the waters of Jordan were cut off before the ark of the covenant of the LORD; when it passed over Jordan, the waters of Jordan were cut off: and these stones shall be for a memorial unto the children of Israel for ever. 2. Isaiah 7: 10-15, KJV: 10 Moreover the LORD spake again unto Ahaz, saying, 11 Ask thee a sign of the LORD thy God; ask it either in the depth, or in the height above. 12 But Ahaz said, I will not ask, neither will I tempt the LORD. 13 And he said, Hear ye now, O house of David; Is it a small thing for you to weary men, but will ye weary my God also? 14 Therefore the Lord himself shall give you a sign; Behold, a virgin shall conceive, and bear a son, and shall call his name Immanuel. 15 Butter and honey shall he eat, that he may know to refuse the evil, and choose the good. 3. Isaiah 38: 4-8, KJV: 4 Then came the word of the LORD to Isaiah, saying, 5 Go, and say to Hezekiah, Thus saith the LORD, the God of David thy father, I have heard thy prayer, I have seen thy tears: behold, I will add unto thy days fifteen years. 6 And I will deliver thee and this city out of the hand of the king of Assyria: and I will defend this city. 7 And this shall be a sign unto thee from the LORD, that the LORD will do this thing that he hath spoken; 8 Behold, I will bring again the shadow of the degrees, which is gone down in the sun dial of Ahaz, ten degrees backward. So the sun returned ten degrees, by which degrees it was gone down. There is far more that should be said, correctly examined, and spiritually apprehended. (For example, 4. 1st Corinthians 14: 1-5, KJV: 1 Follow after charity, and desire spiritual gifts, but rather that ye may prophesy. 2 For he that speaketh in an unknown tongue speaketh not unto men, but unto God: for no man understandeth him; howbeit in the spirit he speaketh mysteries. 3 But he that prophesieth speaketh unto men to edification, and exhortation, and comfort. 4 He that speaketh in an unknown tongue edifieth himself; but he that prophesieth edifieth the church. 5 I would that ye all spake with tongues but rather that ye prophesied: for greater is he that prophesieth than he that speaketh with tongues, except he interpret, that the church may receive edifying.) Even so, I trust this fragment will be useful. Be it unto you according to your faith. Do you agree, the real Messiah is only for Jews and has yet to make an appearance? 1. Genesis 3: 8-15, King James Version (KJV): 8 And they heard the voice of the LORD God walking in the garden in the cool of the day: and Adam and his wife hid themselves from the presence of the LORD God amongst the trees of the garden. 9 And the LORD God called unto Adam, and said unto him, Where art thou? 10 And he said, I heard thy voice in the garden, and I was afraid, because I was naked; and I hid myself. 11 And he said, Who told thee that thou wast naked? Hast thou eaten of the tree, whereof I commanded thee that thou shouldest not eat? 12 And the man said, The woman whom thou gavest to be with me, she gave me of the tree, and I did eat. 13 And the LORD God said unto the woman, What is this that thou hast done? And the woman said, The serpent beguiled me, and I did eat. 14 And the LORD God said unto the serpent, Because thou hast done this, thou art cursed above all cattle, and above every beast of the field; upon thy belly shalt thou go, and dust shalt thou eat all the days of thy life: 15 And I will put enmity between thee and the woman, and between thy seed and her seed; it shall bruise thy head, and thou shalt bruise his heel. 2. Numbers 23: 19, KJV: 19 God is not a man, that he should lie; neither the son of man, that he should repent: hath he said, and shall he not do it? or hath he spoken, and shall he not make it good? 3. Daniel 9: 21-27, KJV: 21 Yea, whiles I was speaking in prayer, even the man Gabriel, whom I had seen in the vision at the beginning, being caused to fly swiftly, touched me about the time of the evening oblation. 22 And he informed me, and talked with me, and said, O Daniel, I am now come forth to give thee skill and understanding. 23 At the beginning of thy supplications the commandment came forth, and I am come to shew thee; for thou art greatly beloved: therefore understand the matter, and consider the vision. 24 Seventy weeks are determined upon thy people and upon thy holy city, to finish the transgression, and to make an end of sins, and to make reconciliation for iniquity, and to bring in everlasting righteousness, and to seal up the vision and prophecy, and to anoint the most Holy. 25 Know therefore and understand, that from the going forth of the commandment to restore and to build Jerusalem unto the Messiah the Prince shall be seven weeks, and threescore and two weeks: the street shall be built again, and the wall, even in troublous times. 26 And after threescore and two weeks shall Messiah be cut off, but not for himself: and the people of the prince that shall come shall destroy the city and the sanctuary; and the end thereof shall be with a flood, and unto the end of the war desolations are determined. 27 And he shall confirm the covenant with many for one week: and in the midst of the week he shall cause the sacrifice and the oblation to cease, and for the overspreading of abominations he shall make it desolate, even until the consummation, and that determined shall be poured upon the desolate. 4. 1st John 2: 22-28, KJV: 22 Who is a liar but he that denieth that Jesus is the Christ? He is antichrist, that denieth the Father and the Son. 23 Whosoever denieth the Son, the same hath not the Father: [but] he that acknowledgeth the Son hath the Father also. 24 Let that therefore abide in you, which ye have heard from the beginning. If that which ye have heard from the beginning shall remain in you, ye also shall continue in the Son, and in the Father. 25 And this is the promise that he hath promised us, even eternal life. 26 These things have I written unto you concerning them that seduce you. 27 But the anointing which ye have received of him abideth in you, and ye need not that any man teach you: but as the same anointing teacheth you of all things, and is truth, and is no lie, and even as it hath taught you, ye shall abide in him. 28 And now, little children, abide in him; that, when he shall appear, we may have confidence, and not be ashamed before him at his coming. There is far more that should be said, correctly examined, and spiritually apprehended. (For example, 5. 1st John 5: 10-12, KJV: 10 He that believeth on the Son of God hath the witness in himself: he that believeth not God hath made him a liar; because he believeth not the record that God gave of his Son. 11 And this is the record, that God hath given to us eternal life, and this life is in his Son. 12 He that hath the Son hath life; and he that hath not the Son of God hath not life.) Even so, I trust this fragment will be useful. Be it unto you according to your faith. Why are the old testament commands no longer bindings? 1. Jesus Christ has established a new platform for the primary meanings and operations of covenant relationship between mankind and the Creator. 2. The Covenant of Moses (often called, “the law” in Scripture) provided those who left Egypt as 12 tribes and a mixed multitude was established through their shared experience featuring tablets of law written by the finger of GOD as well as divine utterance to all who were assembled at the base of Mount Horeb. 3. Commands, ordinances, regulations, and statutes were added to the Decalogue (the Ten Commandments) in order to ensure the correct performance of ceremonies, memorials, observances and rituals within the tabernacle (e.g., atonement, circumcision, diet, offerings, sacrifice); in order to resolve recurring conflicts and settle civil disputes within the camp(s); and in order to establish a shared identity for Israel as the people of GOD. There is far more that should be said, correctly examined, and spiritually apprehended. (For example, 4. Where created beings and living creatures were bound and connected to one another by commitments, contracts, and promises that were to be performed on the basis of ones own self-will (we also say, the flesh; willpower), the new testament features the blood (breath; life essence; spirit; word) of Jesus whereby the bond among believers is through a fresh endowment of spirit substance from the makeup of GOD, and making visible the spirit from GOD contained within the law is paramount. Included are faith, holiness, longsuffering, lovingkindness, oneness without sameness, personshood, righteousness, wisdom, and wrath against sin.) Even so, I trust this fragment will be useful. Be it unto you according to your faith. If Jesus is coming back shouldn’t He get to steppin’ before the world falls apart? 1. The Prophecy: Isaiah 65: 12-18, King James Version (KJV): 12 Therefore will I number you to the sword, and ye shall all bow down to the slaughter: because when I called, ye did not answer; when I spake, ye did not hear; but did evil before mine eyes, and did choose that wherein I delighted not. 13 Therefore thus saith the Lord GOD, Behold, my servants shall eat, but ye shall be hungry: behold, my servants shall drink, but ye shall be thirsty: behold, my servants shall rejoice, but ye shall be ashamed: 14 Behold, my servants shall sing for joy of heart, but ye shall cry for sorrow of heart, and shall howl for vexation of spirit. 15 And ye shall leave your name for a curse unto my chosen: for the Lord GOD shall slay thee, and call his servants by another name: 16 That he who blesseth himself in the earth shall bless himself in the God of truth; and he that sweareth in the earth shall swear by the God of truth; because the former troubles are forgotten, and because they are hid from mine eyes. 17 For, behold, I create new heavens and a new earth: and the former shall not be remembered, nor come into mind. 18 But be ye glad and rejoice for ever in that which I create: for, behold, I create Jerusalem a rejoicing, and her people a joy. 2. The Warning. Revelation 12: 7-12, KJV: 7 And there was war in heaven: Michael and his angels fought against the dragon; and the dragon fought and his angels, 8 And prevailed not; neither was their place found any more in heaven. 9 And the great dragon was cast out, that old serpent, called the Devil, and Satan, which deceiveth the whole world: he was cast out into the earth, and his angels were cast out with him. 10 And I heard a loud voice saying in heaven, Now is come salvation, and strength, and the kingdom of our God, and the power of his Christ: for the accuser of our brethren is cast down, which accused them before our God day and night. 11 And they overcame him by the blood of the Lamb, and by the word of their testimony; and they loved not their lives unto the death. 12 Therefore rejoice, ye heavens, and ye that dwell in them. Woe to the inhabiters of the earth and of the sea! for the devil is come down unto you, having great wrath, because he knoweth that he hath but a short time. 3. His Promise. John 14: 1-3, KJV: 1 Let not your heart be troubled: ye believe in God, believe also in me. 2 In my Father’s house are many mansions: if it were not so, I would have told you. I go to prepare a place for you. 3 And if I go and prepare a place for you, I will come again, and receive you unto myself; that where I am, there ye may be also. There is far more that should be said, correctly examined, and spiritually apprehended. (For example, 4. The End of Mortality. Eternal life has already begun for those of the new creation, who are an instrument divinity will use in establishing the new heavens and earth. Revelation 21: 6-8, KJV: 6 And he said unto me, It is done. I am Alpha and Omega, the beginning and the end. I will give unto him that is athirst of the fountain of the water of life freely. 7 He that overcometh shall inherit all things; and I will be his God, and he shall be my son. 8 But the fearful, and unbelieving, and the abominable, and murderers, and whoremongers, and sorcerers, and idolaters, and all liars, shall have their part in the lake which burneth with fire and brimstone: which is the second death.) Even so, I trust this fragment will be useful. Be it unto you according to your faith. The angel told Mary to call the baby Jesus. Another said call him Christ. A third one said call him Emanuel. What’s that all about? “Carol”, most sinners who turn to GOD for change, correction, and forgiveness are surprised when they find that there is single, unchanging answer provided by divine fullness (we also say, divinity; the GODhead; the Father, the Son, the Holy Spirit). GOD must be apprehended, realized and understood through ones own life process; and sacred knowledge must have a higher place than worldly and secular knowledge. The Creator of all that exists, the various environments and spheres of life, and the frameworks for meaning and value, makes himself knowable, known, accessible, and approachable by appearing to created beings and living creatures using multiple forms and sacred operations. The Bible is a record prepared in many different places and at different times where divinity appears through thousands of events, within thousands of lives, over the course of thousands of years. Because divinity is made up inseparable, invisible spirit substance (e.g., faith, holiness, longsuffering, personhood, righteousness, wisdom, wrath against sin), communication, exchange and interaction with GOD requires the acknowledgment of active presence and spirit through such features as divine law, judgment, covenant relationship, life essence (we say, breath; utterance; word), promise, prophecy, rebirth, and resurrection from the dead. The holy names used among mankind when speaking of divinity change in accordance with the experience and preparation of mankind, yet, GOD is immutable and unchanging. Human needs include accomplishment, customs, hope, novelty, and possibilities. Thus, the heirs of Abraham, who called GOD Jehovah and were set apart (sanctified) for divine service also were influenced by the idolatry, sorcery, and unbelief of the Egyptians until the time of the Exodus. Those who left Egypt with Moses knew GOD as “I AM.” How the people of GOD later spoke and thought of divinity also was altered by the Assyrian captivity and Babylonian exile. Jesus was challenged by both the Roman empire, and the spiritual confusion and traditions that existed among the Jews. Without initiation to the sacred priesthood, it is almost impossible to correctly see that diversity appears in place of change; and that such elements as divine prerogative, eternal purpose, and the sovereign will of GOD continue as though uninterrupted. 1. Exodus 33: 15-17, King James Version (KJV): 15 And he said unto him, If thy presence go not with me, carry us not up hence. 16 For wherein shall it be known here that I and thy people have found grace in thy sight? is it not in that thou goest with us? so shall we be separated, I and thy people, from all the people that are upon the face of the earth. 17 And the LORD said unto Moses, I will do this thing also that thou hast spoken: for thou hast found grace in my sight, and I know thee by name. 2. Exodus 13: 20-22, KJV: 20 And they took their journey from Succoth, and encamped in Etham, in the edge of the wilderness. 21 And the LORD went before them by day in a pillar of a cloud, to lead them the way; and by night in a pillar of fire, to give them light; to go by day and night: 22 He took not away the pillar of the cloud by day, nor the pillar of fire by night, from before the people. 3. Hebrews 8: 1-6, KJV: 1 Now of the things which we have spoken this is the sum: We have such an high priest, who is set on the right hand of the throne of the Majesty in the heavens; 2 A minister of the sanctuary, and of the true tabernacle, which the Lord pitched, and not man. 3 For every high priest is ordained to offer gifts and sacrifices: wherefore it is of necessity that this man have somewhat also to offer. 4 For if he were on earth, he should not be a priest, seeing that there are priests that offer gifts according to the law: 5 Who serve unto the example and shadow of heavenly things, as Moses was admonished of God when he was about to make the tabernacle: for, See, saith he, that thou make all things according to the pattern shewed to thee in the mount. 6 But now hath he obtained a more excellent ministry, by how much also he is the mediator of a better covenant, which was established upon better promises. There is far more that should be said, correctly examined, and spiritually apprehended. (For example, 4. Matthew 28: 18-20, KJV: 18 And Jesus came and spake unto them, saying, All power is given unto me in heaven and in earth. 19 Go ye therefore, and teach all nations, baptizing them in the name of the Father, and of the Son, and of the Holy Ghost: 20 Teaching them to observe all things whatsoever I have commanded you: and, lo, I am with you always, even unto the end of the world. Amen.) Even so, I trust this fragment will be useful. Be it unto you according to your faith.